With the start of the 2018 season, Johnson & Wales University’s (JWU) colors of blue and gold are lighting up the TD Garden during Boston Bruins and Celtics home games. 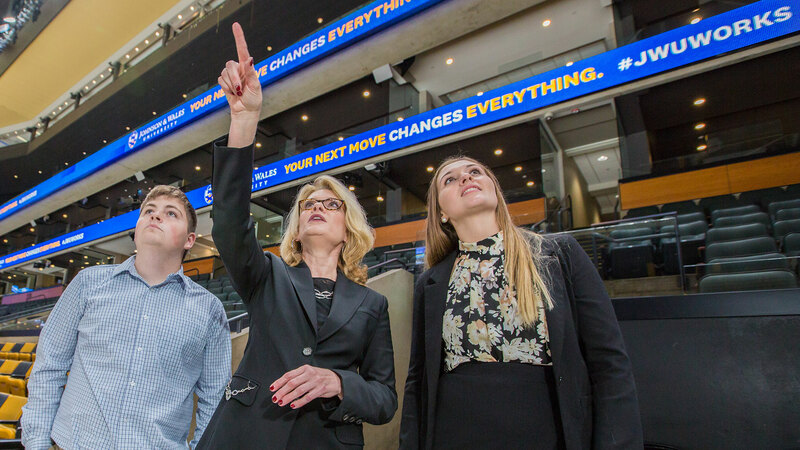 The massive 360-degree LED board positioned high above the arena that shares the game’s action with the thousands of roaring fans will prominently showcase JWU as the Official Education Partner of the Boston Bruins and TD Garden. Angelo Pitassi; Mim L. Runey, LP.D. ; Cindy Parker, Ed.D. This multifaceted, five-year partnership, signed summer of 2018, includes experiential education opportunities for current undergraduate JWU students and offers a tuition benefit to the approximately 50,000 employees of Delaware North, TD Garden and the Boston Bruins. Employees who meet the university's admissions criteria will receive a corporate partner scholarship towards more than 50 undergraduate, graduate and certificate degrees in areas such as hospitality, food service, business, and human resources, delivered by the JWU College of Online Education, and onground in the university’s continuing education and graduate programs at the Providence Campus. For more information, employees may visit online.jwu.edu/jwu-bruins-announcement. Experiential education is a cornerstone of the JWU education. Students in the College of Hospitality Management classes led by Patrick Leary, Ed.D., department chair and associate professor, Sports, Entertainment, Event – Management, will research and develop solutions to real–time industry issues identified by TD Garden, Boston Bruins and Delaware North leadership. Executives will collaborate with faculty and students as they investigate the selected issues. In addition, JWU will develop an annual seminar program to be held at TD Garden on topics and issues relevant to its academic programming in the areas of foodservice, hospitality, and sports, entertainment and event management. Segments will be filmed and aired on NESN’s “Behind the B” next year. 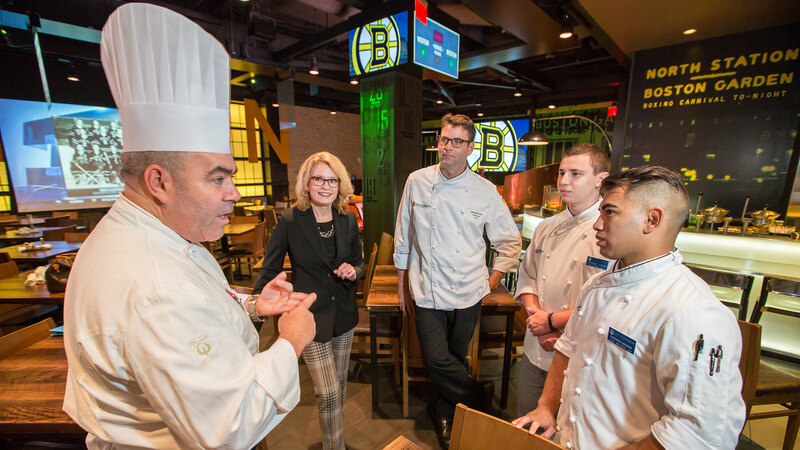 JWU, known nationally as a leader in culinary arts education, will also create a “JWU item of the month” to be served in Legends, a private, members-only restaurant and bar located on level 3 of TD Garden, open exclusively to Bruins and Celtics season ticket and game plan holders. Following criteria specified by Legends, students in the College of Culinary Arts will develop four new menu items per season over the course of the partnership. The Legends menu will feature a Johnson & Wales item that will change approximately every 20 games. Currently, JWU Chef Matthew Britt is leading his Contemporary Casual Concepts classes in the creation of the first menu items. JWU offers more than 50 online degree programs through the College of Online Education, so students can learn anytime, anywhere. Delaware North, TD Garden, and Boston Bruins employees can take advantage of this flexible and convenient online option or enroll in evening and weekend courses in Providence, giving them the opportunity to further their education and achieve their goals. "It is always rewarding for us at Delaware North to form business relationships that are truly symbiotic in nature," said Charlie Jacobs, CEO of Delaware North's Boston Holdings. "The opportunity to collaborate with such a profound educational institution is incredibly exciting for all of us in Boston and Delaware North as a whole." To read the full press announcement, click here.